Designed by Lincoln Gray, Sales Manager of Sierra Stream and Mountain in Chico, CA . Lincoln operates a stillwater flyfishing school, Stillwater Fly Fishing Adventures, on Lake Almanor and has been developing a series of hex patterns based upon his 20 years of fishing this lake. Most of the patterns have been a collaborative effort between Lincoln and his twin brother, Lance. An excellent article on Lincoln's fly patterns, written by Tim Warriner, was published by Fly Tyer Magazine in Summer 2008. Bill Carnazzo wrote a nice piece profiling Lincoln's Stillborn Hex in the Jan/Feb 2012 issue of California Fly Fisher. Lincoln is quoted, "The Hexagenia Stillborn was developed for one reason only, to catch more fish on Lake Almanor. Over many years of guiding and instructing students in my schools, it occurred to me that I might be missing an aspect of the Hexagenia limbata mayfly hatch that had the potential to raise catch rates significantly - the stillborn form of this insect. As I began to investigate this possibility, I saw what appeared to be many unopened or just barely opened shucks on the water. A closer look revealed that inside the floating exoskeleton were fully formed, but dead adults that were for some reason unable to wiggle free of the case. 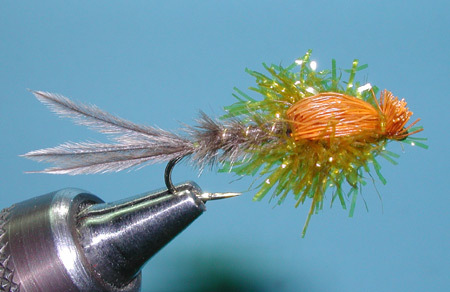 A light bulb went off in my head: while cripple patterns, paracripples, duns, and nymphs are the flies du jour for the Hex hatch, they don't always work. 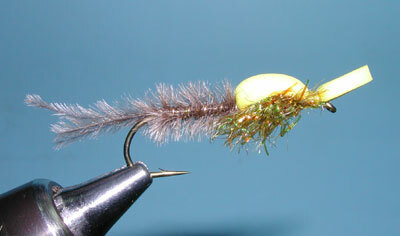 Why not cobble up a fly that lies in or just below the surface film to imitate the stillborn form?" Lincoln spent about seven years designing and testing various patterns. Two evolved from this process. The version that rides lower within the surface film uses a Elk Hair wing case. This is perfect for calm evenings with flat water surfaces. However, during windy conditions in which the surface is stirred up a foam wing case works better. "My method for fishing both pattern styles is simple. I normally first tie on a cripple or paracripple patterns. I then tie a 14-16 inch piece of tippet material to the bend of that fly and tie on the Hexagenia Stillborn as my point fly. Once I have cast the rig, I let the flies sit for a moment or two and then give them a twitch, followed by another pause and then a strip. The cripple patterns serves as an indicator, which helps strike detection, since the stillborn imitation is very difficult to see on the water, especially at dusk or near dark."